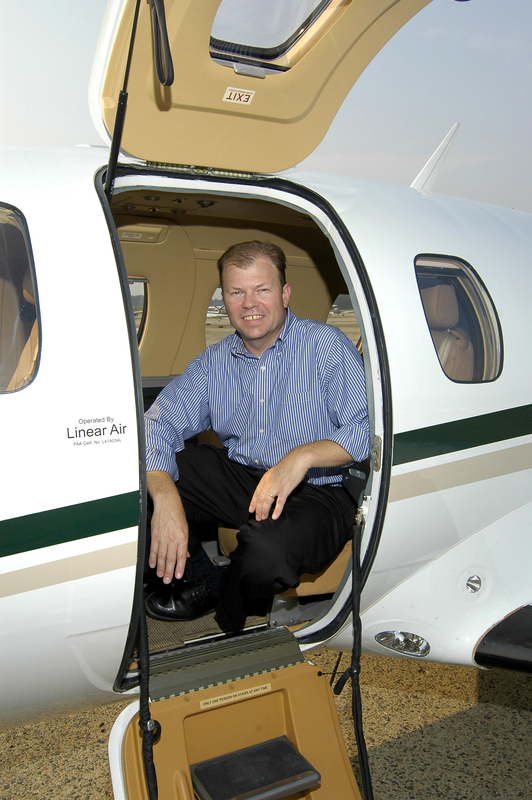 Since 2004, when William Herp formed Linear Air, a private air charter company, he’s been working toward a goal. That wasn’t the first time Herp had seen an opportunity and taken it. After graduating from Harvard Business School in 1989, he started a cell phone company. He sold it to Shared Technologies Fairchild 18 months later. When he saw the market for wine opening up in the early 1990s, he became a wine wholesaler. Herp then became vice president and CFO of Geerlings & Wade Inc., a direct-to-consumer winery business. He supervised the company’s 1994 public offering, which raised $10 million. In the mid-1990s, Herp launched e-Dialog, a venture-backed business that used the Internet and email as a direct-marketing tool. He managed to hang on during the dot-com crash, rebuilding e-Dialog while concurrently looking at the emerging VLJ technology. Herp believed an opportunity existed for him to begin establishing a brand name among customers, investors, manufacturers and regulators. He decided to fly a proxy to develop the economics of the Eclipse 500. Based at Laurence G. Hanscom Filed (BED) in Bedford, Mass., Linear initially utilized one Caravan in the Boston area. In 2005, Herp, who serves as Linear’s president and CEO, added two more of the single-engine turboprops and began offering service to New York and Washington, D.C.
With a fleet of six eight-passenger executive-configured Caravans, Herp’s company has successfully built its reputation providing on-demand air charter to customers who fly to the Caribbean, Puerto Rico, the Mid-Atlantic and Canada. Herp said that by flying the Caravan, Linear has been building a business among the ideal customer base for the Eclipse 500. “We realized they fly the same types of trips, but with the Eclipse, they’ll reach their destination twice as fast,” he said. He also compared space, saying the difference in room for an individual person isn’t significant. Within the last five months, Herp has added two Eclipse 500 VLJs to Linear’s charter fleet. The company’s first Eclipse entered service on Nov. 13, 2007, and the second jet arrived in mid-December. “Currently, we’re in the acceptance process of obtaining our third Eclipse,” he said. Herp’s plan is to have 10 jets in service by the end of the year for his point-to-point, on-demand charter business model. The Eclipse 500 is certified to fly up to 41,000 feet. Like any operator that flies the Eclipse VLJ in reduced vertical separation minimum airspace, between 29,000 and 41,000 feet, Linear must provide both an operation and maintenance RVSM manual to the Federal Aviation Administration. The FAA also requires that each Eclipse type-rated pilot undergo applicable training. As Linear obtains more aircraft, it will apply for RVSM certification. Until then, Linear’s pilots are able to fly up to 28,000 feet. Meanwhile, Herp is hopeful that Eclipse Aviation will obtain certification from the FAA for flight into known icing within a couple of months. “The good news is that it’s warming up as spring approaches,” he said. Under FAA regulations, Linear uses the Caravan for limited scheduled service. Herp said that amounts to about six percent of the company’s business. When it comes to Linear’s VLJ air taxi service, Herp decided against DayJet’s per-seat model, which operates 28 Eclipse jets. He said Linear’s typical customer is a team of business people—possibly two or three—traveling from a major metropolitan area to a secondary or tertiary market. Linear estimates that up to 25 percent of the overall airline market is comprised of customers flying to secondary or tertiary markets. “Take three people traveling together on a commercial airline,” he said. “The trip will cost typically about $4,000 once you layer in hotel charges, since you can’t get there and back the same day. Many of these types of trips, happening every day, could transition to an Eclipse air taxi. Business travelers are fed up with the atrocious service standards of the airlines and are eager for alternatives. We’ll give them an amazingly higher level of service than they’d get on the airlines for something close to the same economics. “Many of these customers book at the last minute and get the worst and most expensive seats on the airplane. Herp believes the first big opportunity to grow the business is in his existing customer base. One thing he’d like to address is the airline industry’s claim that VLJs are adding to the already crisis-like air traffic congestion. He said the value in the air taxi model is in avoiding the congested airports that the airlines dominate. He also had a bright forecast for the future of GA.
“I think that five years from now, we’ll have a sufficient distribution of customers who perceive flying privately to be as easy as buying an airline ticket or renting a car,” he said. For more information, visit [http://www.linearair.com].